Ireland U20 head coach Noel McNamara has made five changes to his side to face South Africa in the world championship tomorrow afternoon. It is Ireland's second game of the tournament, having picked up a losing bonus point in the narrow 26-24 defeat to hosts France on Wednesday night. Ireland need a win to keep their semi-final hopes alive and McNamara has brought in some fresh blood to try and topple the Junior Springboks. Four of the changes have been made in the backline, with scrum-half Hugh O'Sullivan and out-half Harry Byrne rotated to the bench in place of Jonny Stewart and Conor Dean respectively. Sean O'Brien comes in on the wing in place of the injured Dan Hurley, while James Hume gets the nod at 12 instead of Peter Sylvester. In the pack, Cormac Daly comes in at second row for Matthew Dalton. The game kicks off in Narbonne tomorrow at 3.30pm Irish time. Ireland have been handed a tough pool at this summer's World Rugby U-20 Championship, after the schedule was revealed this afternoon. The Ireland U20 team will play their home Six Nations games in a new venue in 2019 after the announcement that the side will take on England and France at Irish Independent Park. 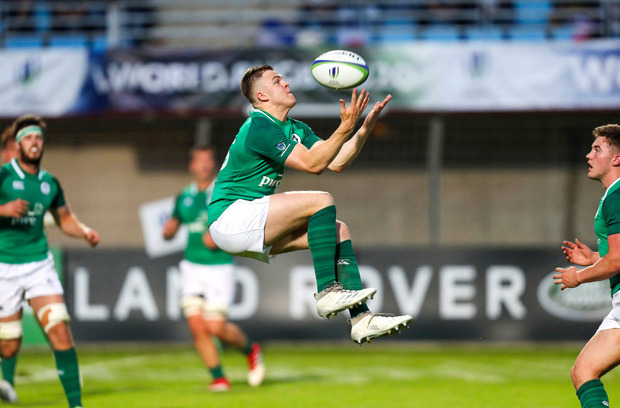 Ireland held out to survive relegation from the U20 World Championship after a thrilling nine-try encounter with Japan.